We live in a world where most movies, despite being called “live action,” are a mixture of real people and computer generated reality. And there seems to be a lot more of the computer generated world than real world lately. With our lives being controlled by all our electronic devices, our hold on reality seems to be slipping more and more. 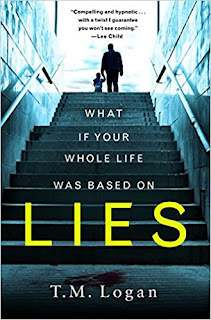 In Lies, author T.M. Logan explores the perception of reality and its fragility. Joe Lynch is a happy man. He has a lovely wife and a wonderful son, and goes to work each day as a teacher. However, one day, he sees his wife out where he didn’t expect to see her with someone he didn’t expect her to be with. The moment he sees her with their friend, Ben, his whole life turns upside down. After a confrontation with the friend, that friend disappears. What starts out as a seeming moment of simple anger and walking away to blow off steam turns into a nightmare for Joe. Nothing is quite what it seems. Ben’s disappearance brings scrutiny to the interaction Joe had with him after the meeting with his wife. Mounting evidence leads the police to bring Joe in and charging him with murder. Joe’s whole reality is skewed. Despite everything he knows, the reality perceived by others is drastically different. Joe must fight against the mounting evidence of his guilt before it’s too late. Throughout this book, reality is twisted through dependence on our electronic devices. Each time Joe thinks he’s getting ahead, he falls two steps behind. Lies is a fast-paced book that keeps you on the edge of your seat as you try to keep up with Joe trying to prove his innocence. Every trail left behind on his devices points towards his guilt. The reader knows he’s innocent, but the path to innocence seems to be unlikelier with each turn of the page. Will he be able to outsmart the person or people setting him up? Or will he run out of time? This novel makes you stop for a moment and think about how much our phones, laptops, and tablets control our lives. There are computer savvy people in the world who can alter your digital footprint to take the attention away from the real culprits. How can you defend yourself? Would you be able to persevere over the relentless efforts of those set on destroying your reputation? This book kicks off right away in high gear, and keeps that pace for most of the novel. I had figured out part of the ending well before I got there. There was a bit of a twist at the end that I was not quite prepared for. It was an intriguing premise where a totally innocent victim was set up, and the fight for freedom gets your heart beating. This was T.M.Logan’s first novel. There is a follow up titled, 29 Seconds. I hope to be able to read it very soon. Our library system doesn’t have it yet. I may have to visit the bookstore very soon. Craig Bacon likes reading thrillers. Especially ones that are centered around a seemingly innocuous piece of our everyday lives.